Who we are……A commitment to science education. 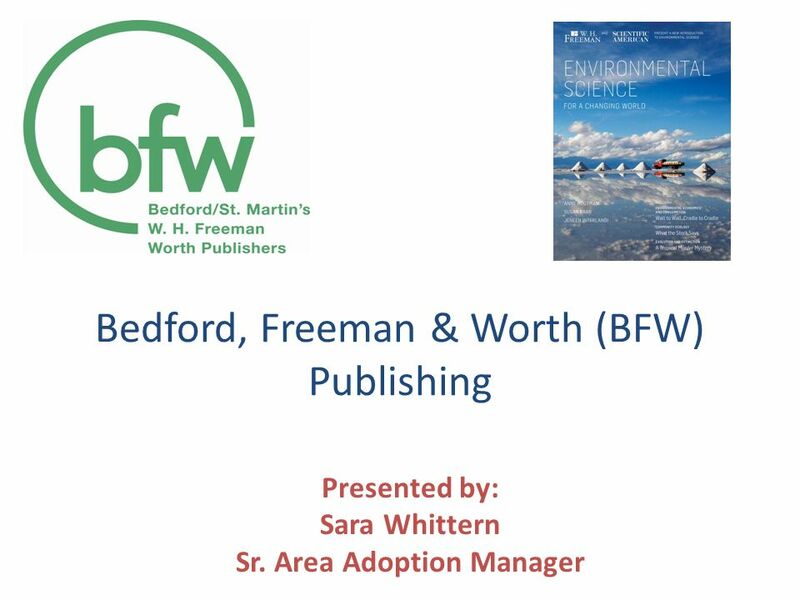 Bedford, Freeman and Worth Publishing (BFW) is part of Macmillan Science and Education. 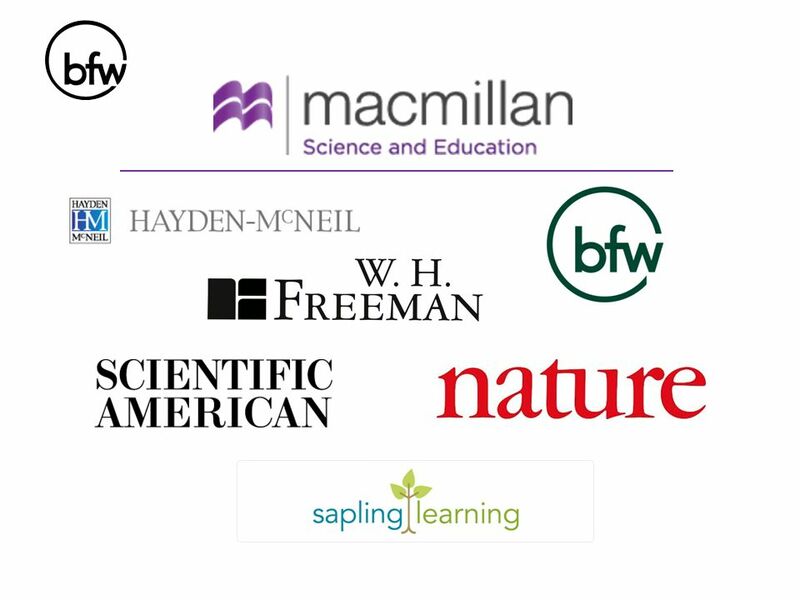 Our sister companies include: the Nature Publishing Group as well as Scientific American. 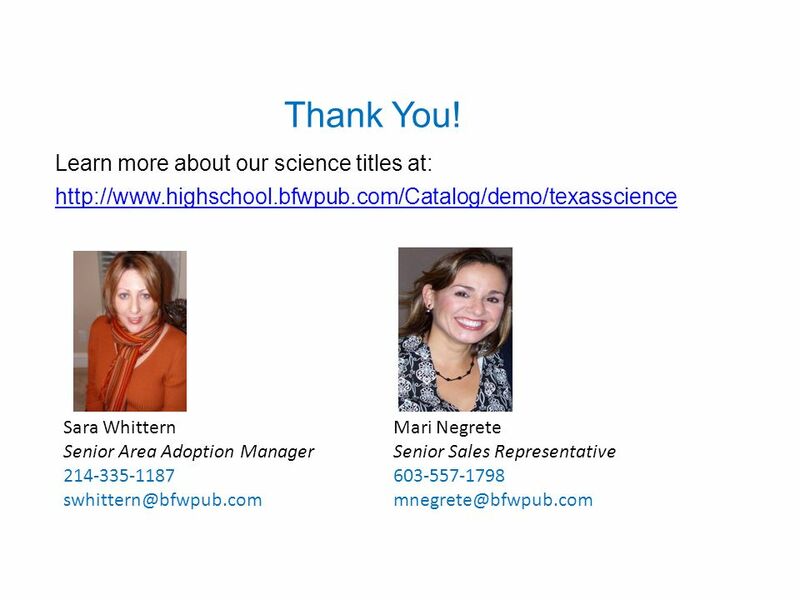 Sapling Learning (An Austin, TX based company) was added to our portfolio of companies in As you can easily see, we have a commitment to Science Educational Publishing. rt of Macmillan Science and Education. 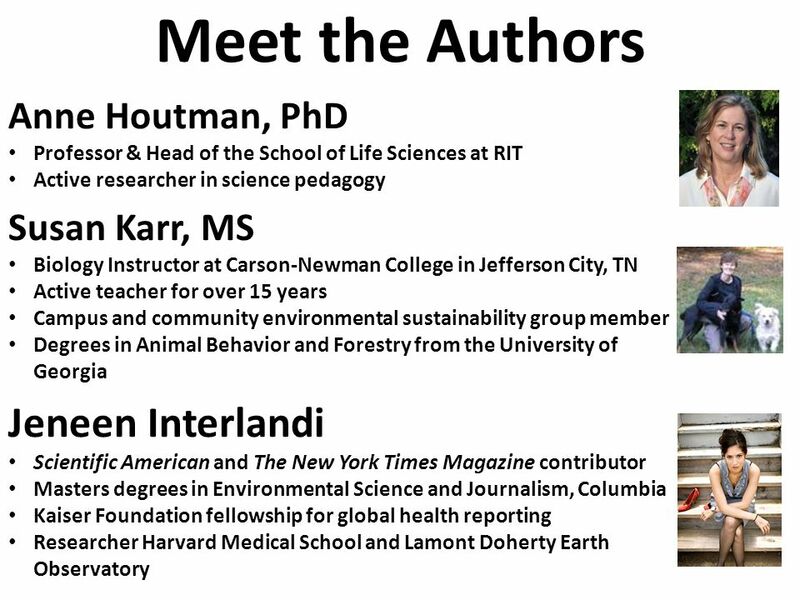 Professor & Head of the School of Life Sciences at RIT Active researcher in science pedagogy Susan Karr, MS Biology Instructor at Carson-Newman College in Jefferson City, TN Active teacher for over 15 years Campus and community environmental sustainability group member Degrees in Animal Behavior and Forestry from the University of Georgia Jeneen Interlandi Scientific American and The New York Times Magazine contributor Masters degrees in Environmental Science and Journalism, Columbia Kaiser Foundation fellowship for global health reporting Researcher Harvard Medical School and Lamont Doherty Earth Observatory Anne Houtman, PhD, is Professor and Head of the School of Life Sciences at Rochester Institute of Technology, which includes programs in Environmental and Biological Sciences. Her research interests are in the behavioral ecology of birds, and currently research in her laboratory focuses on the ecology and evolution of hummingbird song. She also has an active research program in science pedagogy. Anne received her doctorate in zoology from the University of Oxford and conducted postdoctoral research at the University of Toronto. Susan Karr, MS, is an Instructor in the Biology Department of Carson-Newman College in Jefferson City, Tennessee, and has been teaching for over 15 years. She has served on campus and community environmental sustainability groups and helps produce an annual “State of the Environment” report on the environmental health of her county. In addition to teaching non-majors courses in environmental science and human biology, she teaches an upper-level course in animal behavior where she and her students train dogs from the local animal shelter in a program that improves the animals’ chances of adoption. She received degrees in Animal Behavior and Forestry from the University of Georgia. Jeneen Interlandi is a science writer who contributes to Scientific American and The New York Times Magazine. Previously, she spent four years as a staff writer for Newsweek, where she covered health, science, and the environment. In 2009, she received a Kaiser Foundation fellowship for global health reporting and traveled to Europe and Asia to cover outbreaks of drug-resistant tuberculosis. Jeneen has worked as a researcher at both Harvard Medical School and Lamont Doherty Earth Observatory. She holds Masters degrees in Environmental Science and Journalism, both from Columbia University in New York. 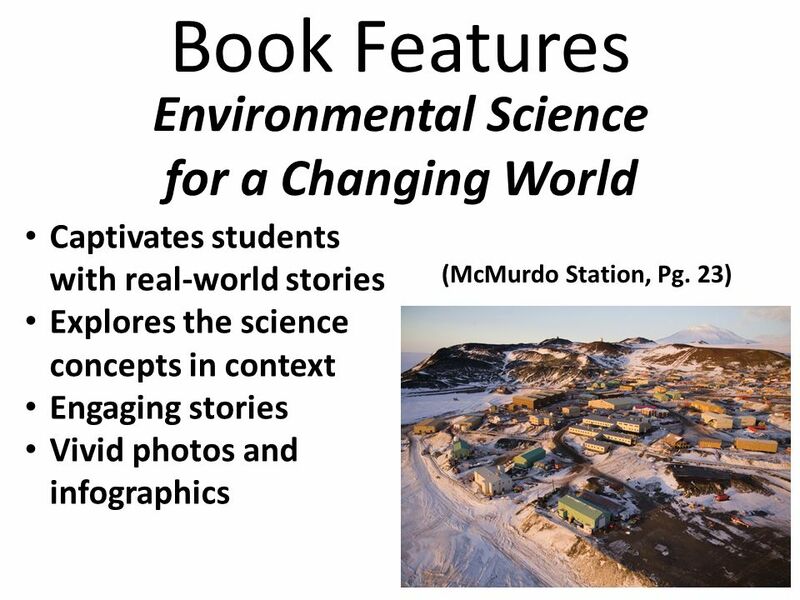 Book Features Environmental Science for a Changing World Captivates students with real-world stories Explores the science concepts in context Engaging stories Vivid photos and infographics (McMurdo Station, Pg. 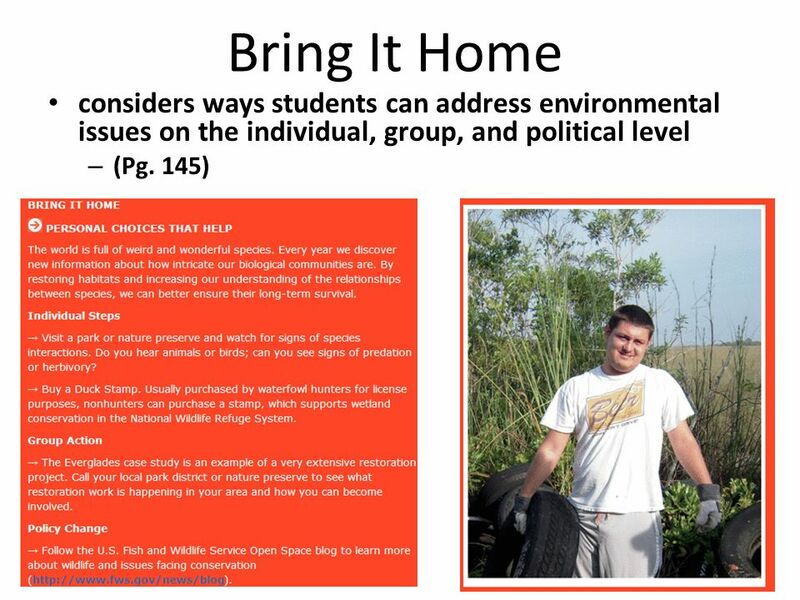 23) Environmental Science for a Changing World captivates students with real-world stories while exploring the science concepts in context. Engaging stories plus vivid photos and infographics make the content relevant and visually enticing. 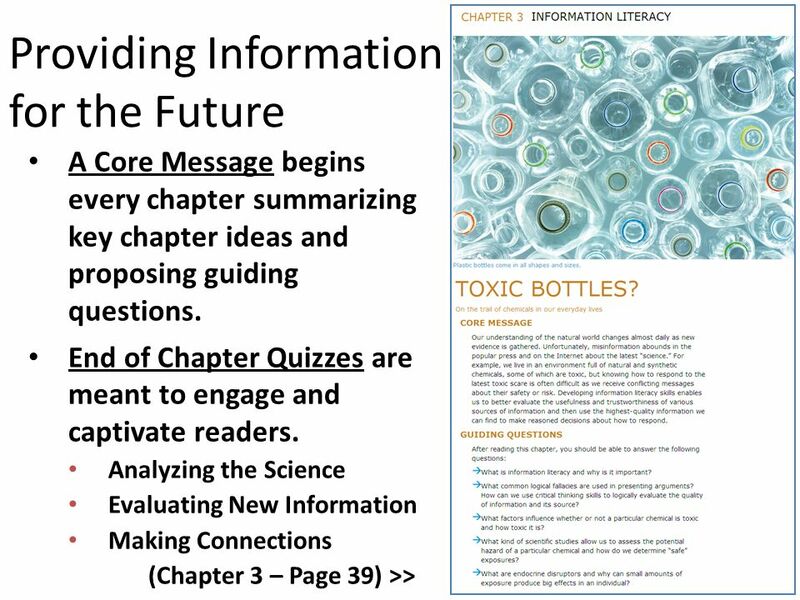 The result is a text that emphasizes environmental, scientific, and information literacies in a way that engages students. 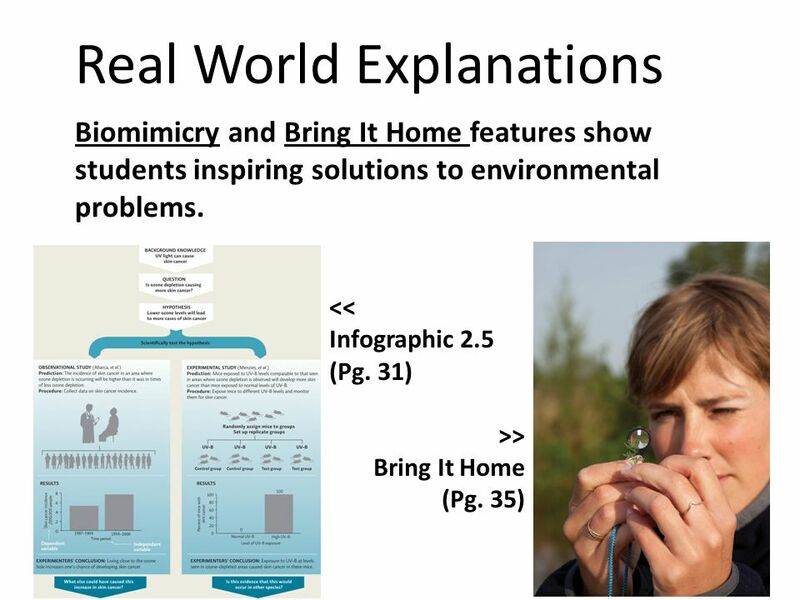 Science Taught in the Context of Real-World Stories Engaging stories illuminate pressing environmental issues in context. Each story features scientists working in the field and everyday people tackling environmental problems and finding solutions. Running Margin Glossary means students encounter important terms in context. Real Voices, Characters, and Photos draw students in and bring concepts to life. 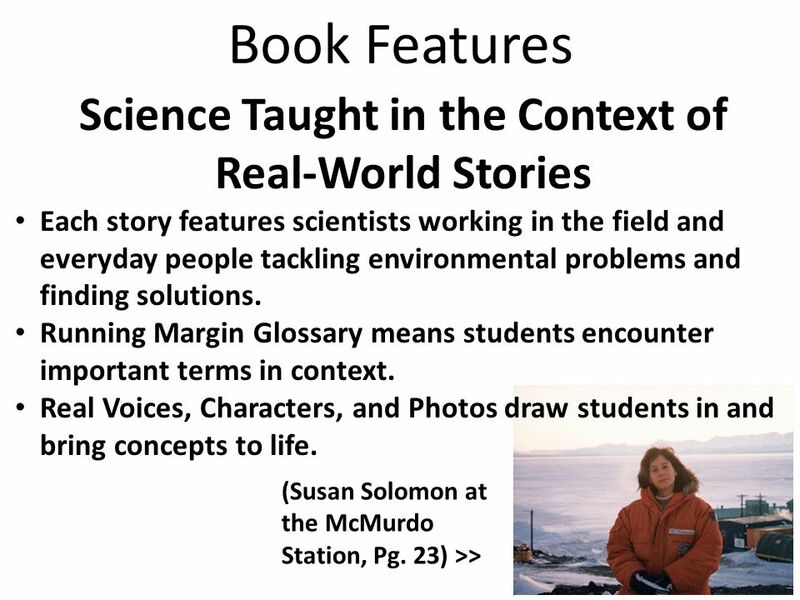 Pictures are of the McMurdo Station, the largest human settlement in the Antarctic, and of Susan Solomon at the McMurdo Station in 1987 (Chapter 2, page 23). 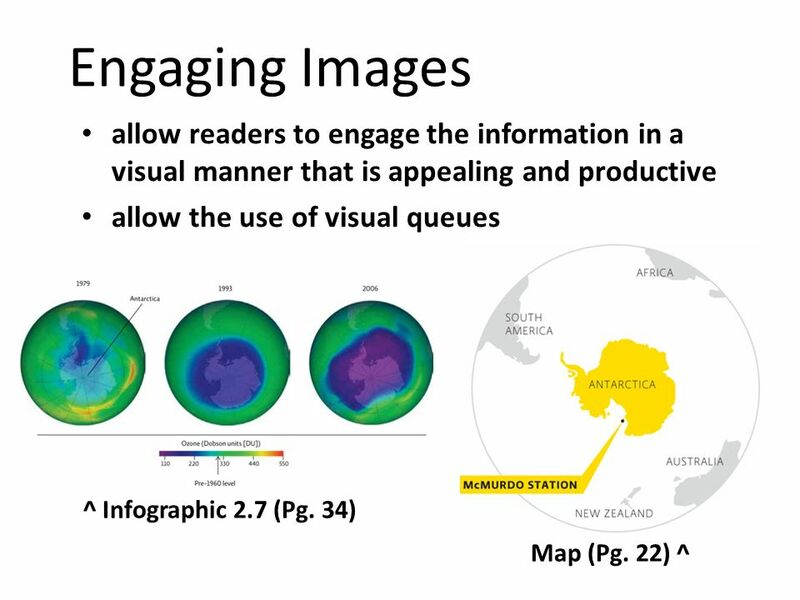 There is a map later in this presentation that shows where the station is located. 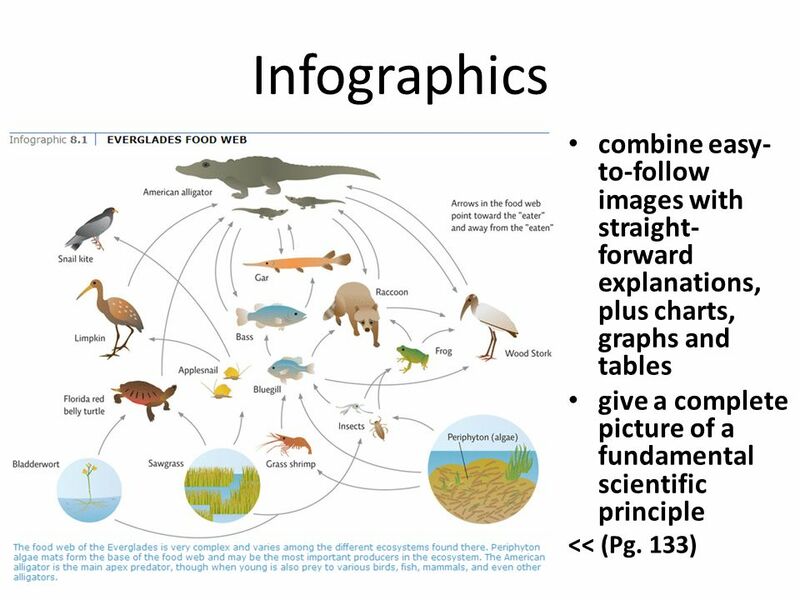 16 Infographics combine easy-to-follow images with straight-forward explanations, plus charts, graphs and tables give a complete picture of a fundamental scientific principle << (Pg. 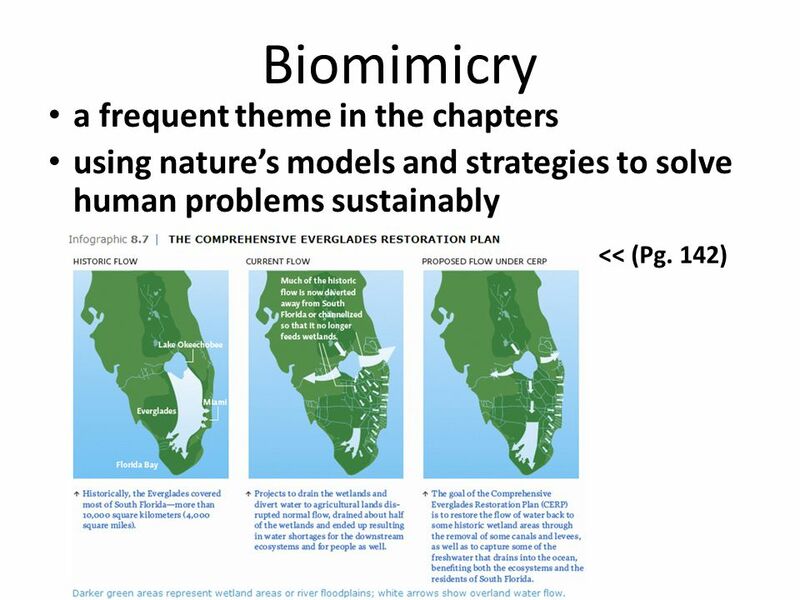 133) Infographic 8.1 is from page 133 in the printed text. 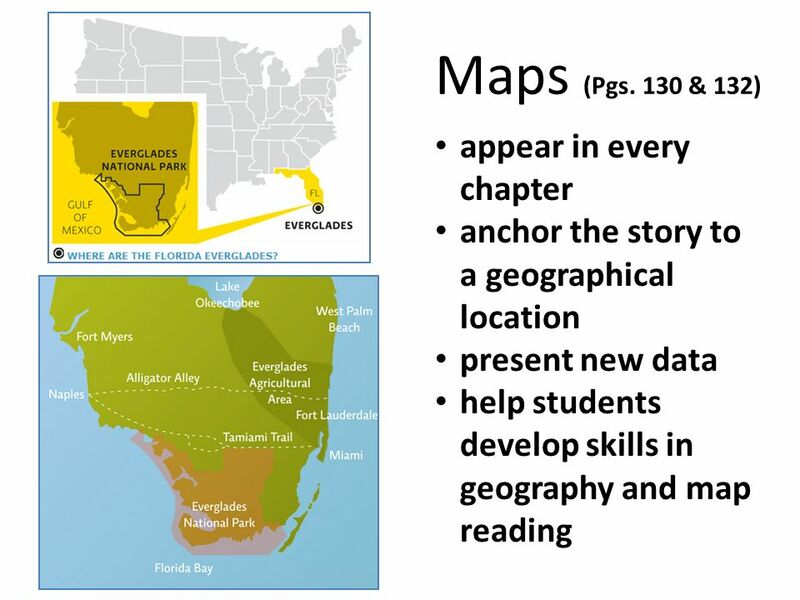 anchor the story to a geographical location present new data help students develop skills in geography and map reading Maps from Chapter 8, found on pages 130 and 132 in the printed text. 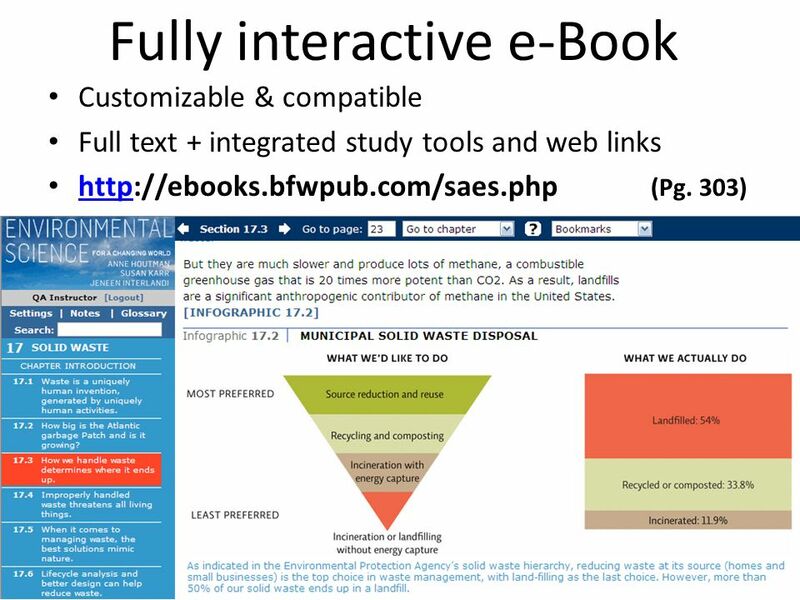 Fully Interactive eBook – Book Companion Site – EnviroPortal – Computerized Test Bank Instructor’s resource DVD Chapter 2 (Pg. 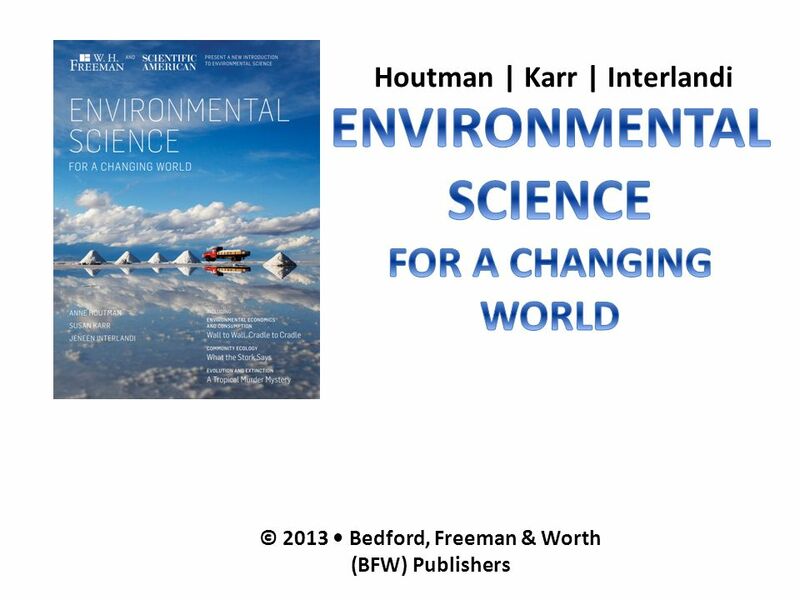 20) as seen on e-Book >> Along with the Environmental Science for a Changing World textbooks, Bedford, Freeman, and Worth also offer an array of media supplements to help both inside and outside the classroom. Fully Interactive eBook allows students to use the text through any compatible electronic device. 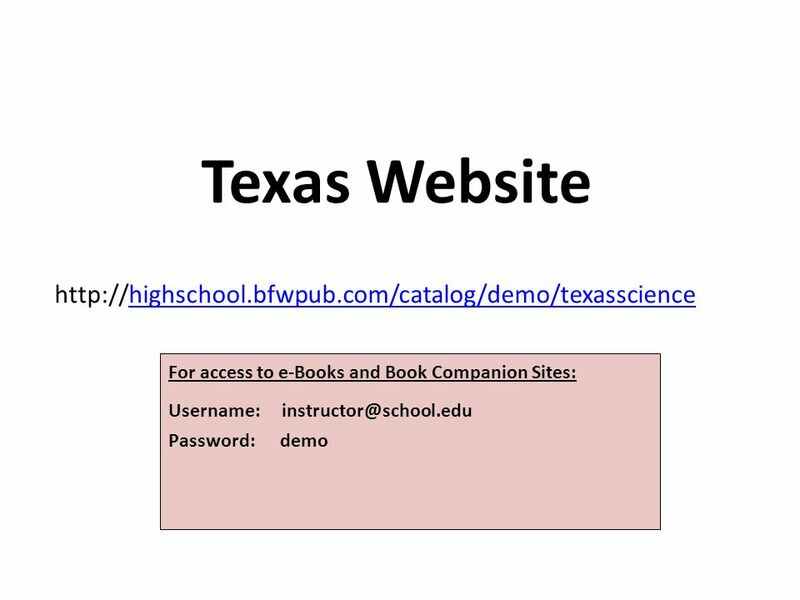 These eBooks are customizable and contain the full text as well as integrated study tools and web links. 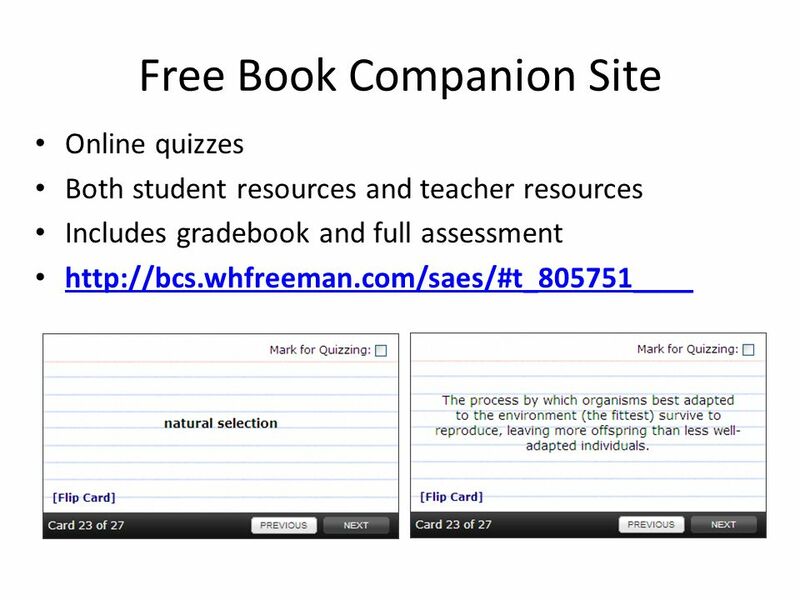 ( The Book Companion Site is a free tool that offers online quizzes, as well as resources for both teachers and students. A full assessment along with a gradebook are included. 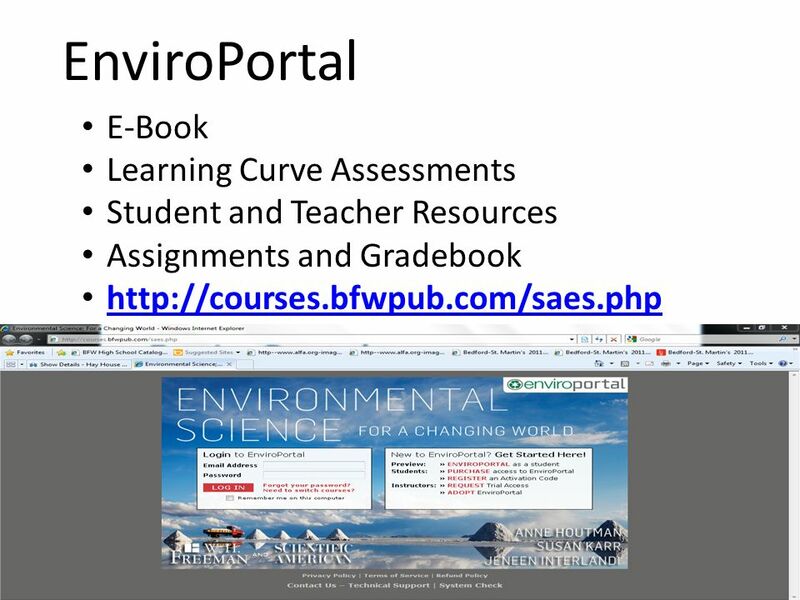 ( If you are looking to take your course online, there is no better tool than EnviroPortal. 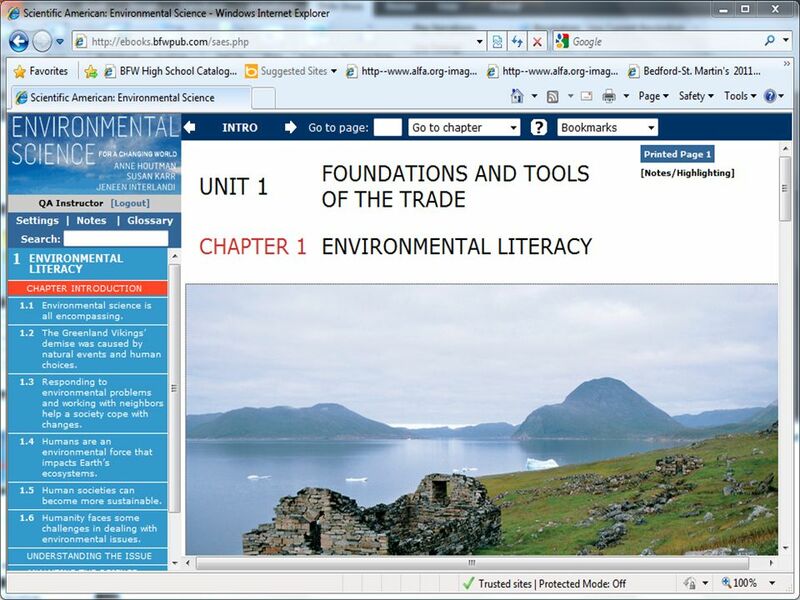 Merging our browser-based eBook and other resources, Enviroportal is your ready-made website. It includes a powerful quizzing engine, and assignment center, and resource center, where all student responses and grades are fed directly to your grade book. 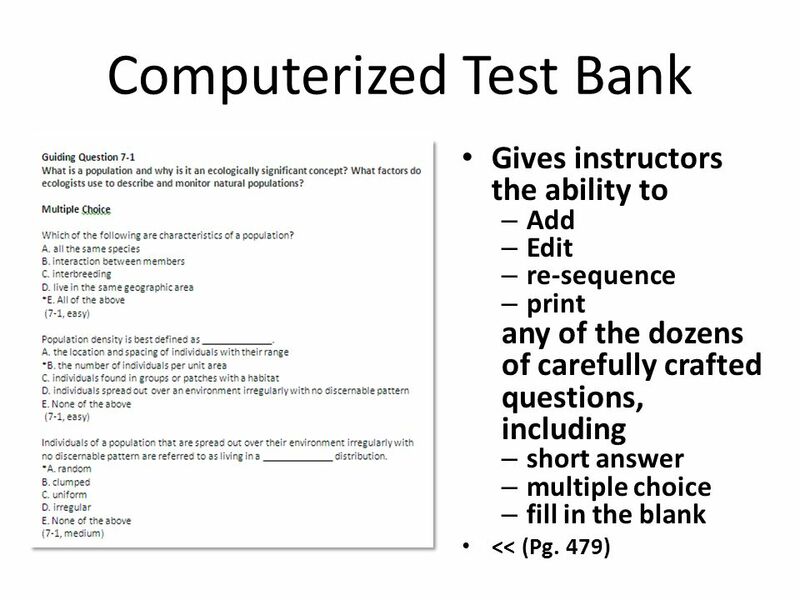 ( Computerized Test Bank gives instructors the ability to add, edit, re-sequence, and print any of the dozens of carefully crafted questions, including short answer, multiple choice, and fill in the blank. 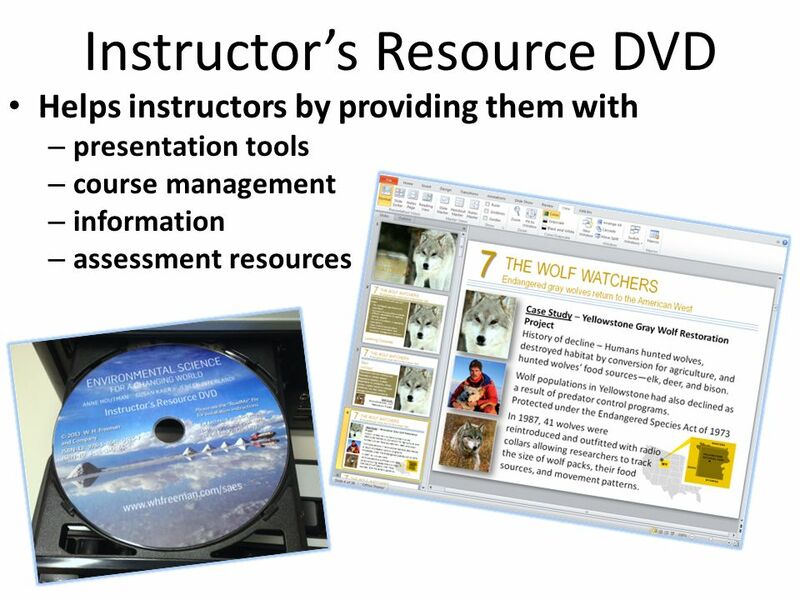 Instructor’s resource DVD also helps instructors by providing them with presentation tools, course management information and assessment resources. Customizable & compatible Full text + integrated study tools and web links (Pg. 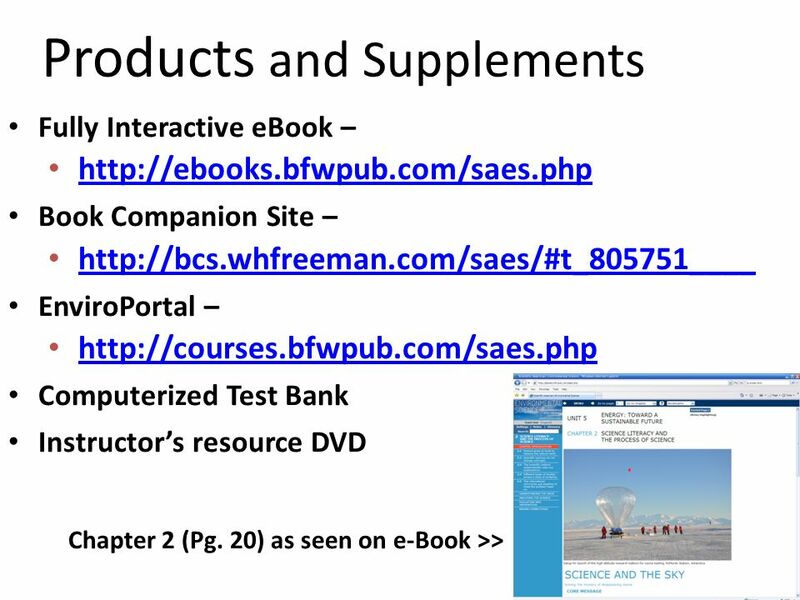 303) Fully Interactive eBook allows students to use the text through any compatible electronic device. These eBooks are customizable and contain the full text as well as integrated study tools and web links. 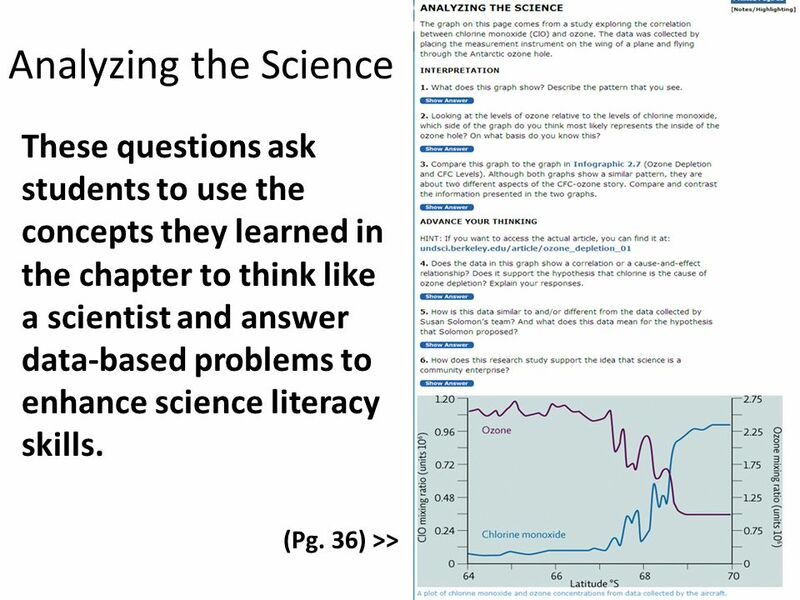 ( Infographic 17.2 is on page 303 in the text, but this is how it appears on the e-Book. Screen shot of our Book Companion Website. A free resouce for our adopters. 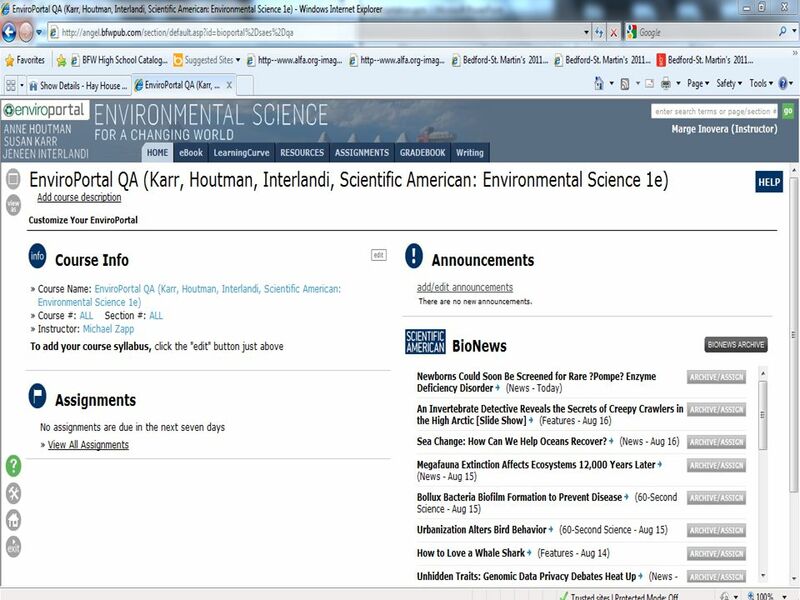 23 A Screen shot of our premium resource, EnviroPortal. 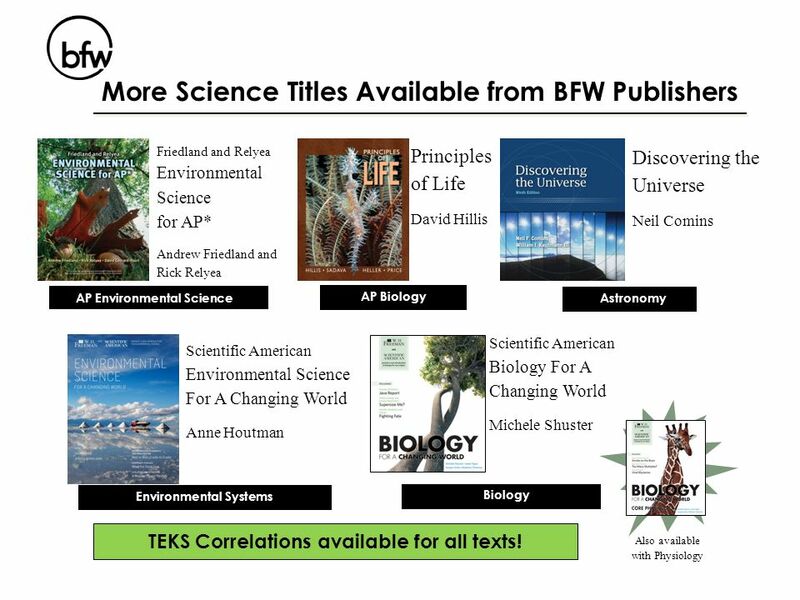 27 TEKS Correlations available for all texts! Download ppt "Bedford, Freeman & Worth (BFW) Publishing"
An Integrated Approach to Computer and Information Literacy Linda Ehley Alverno College Associate Professor CS EDUCAUSE 2003 Copyright – Linda Ehley 2003. Howard University Libraries LibGuides System. Overview Introduction to LibGuides. Accessing LibGuides from the library’s website. Using LibGuides to promote. 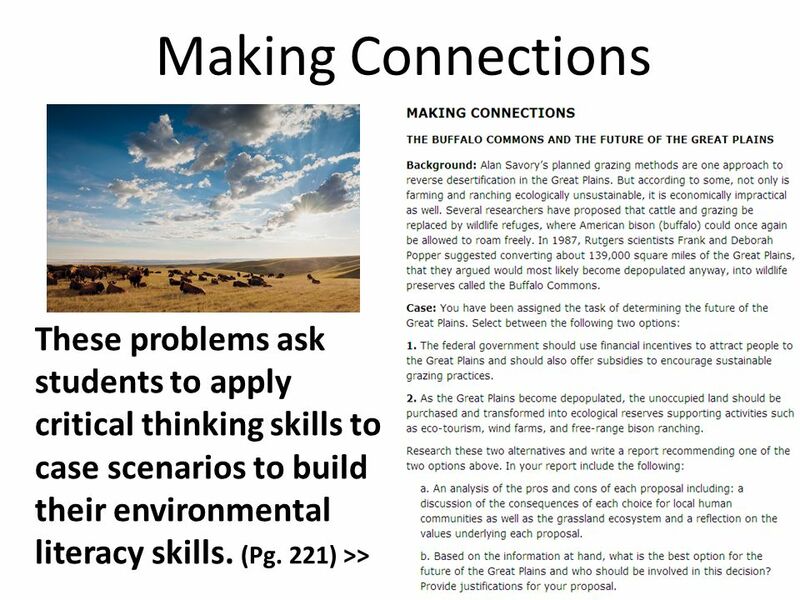 Environmental Science: A Global Concern, 9/e by Cunningham/Cunningham/Saigo How it helps you succeed:  Critical Thinking Emphasis  Learning to Learn. The Call To Write, Third edition Chapter One, What is Writing? Analyzing Literacy Events. CIT110 – Introduction to Information Technology Dr. Catherine Dwyer Fall 2011. CIT110 – Introduction to Information Technology Dr. Catherine Dwyer Fall 2010. 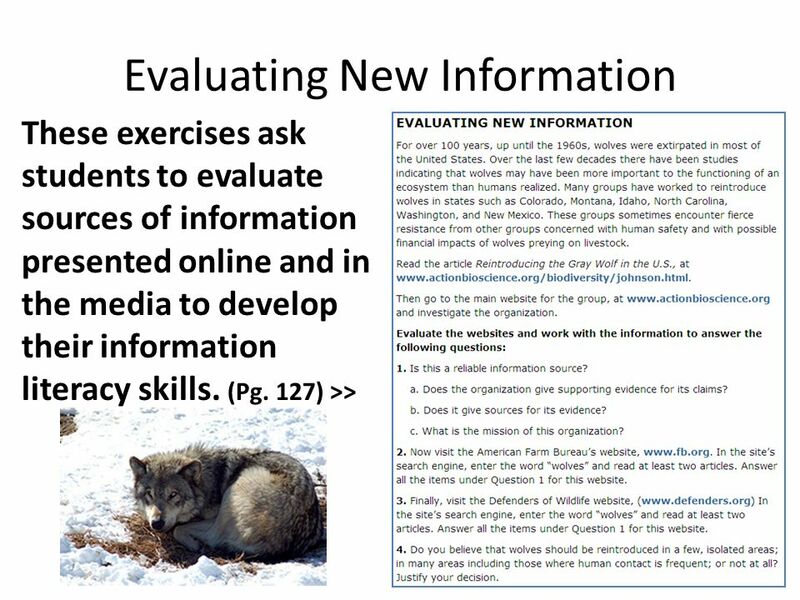 Information Research Lib101. Can You Find the Answers? n Use the PSU homepage: u How many international students are at PSU? n Use Library page: u How. Ch1: The World of Communication Copyright © 2006 Wadsworth 1 Professor: Course/Section: You may be surprised to learn that over 20% of all undergraduate. University of Delaware Workshops on Problem-Based Learning International Islamic University Malaysia Integrating Information Technology. EVIDENCE BASED WRITING LEARN HOW TO WRITE A DETAILED RESPONSE TO A CONSTRUCTIVE RESPONSE QUESTION!! 5 th Grade ReadingMs. Nelson EDU 643Instructional. Grade 8 English Teachers – September 28, 2009 Facilitated by: Kim Boettcher and Toni Thompson. 1. Addresses the Common Core Standards 2. Differentiation 3. Supports RtI 4. Technology/On-line Resources 5. Results Top Benefits of. 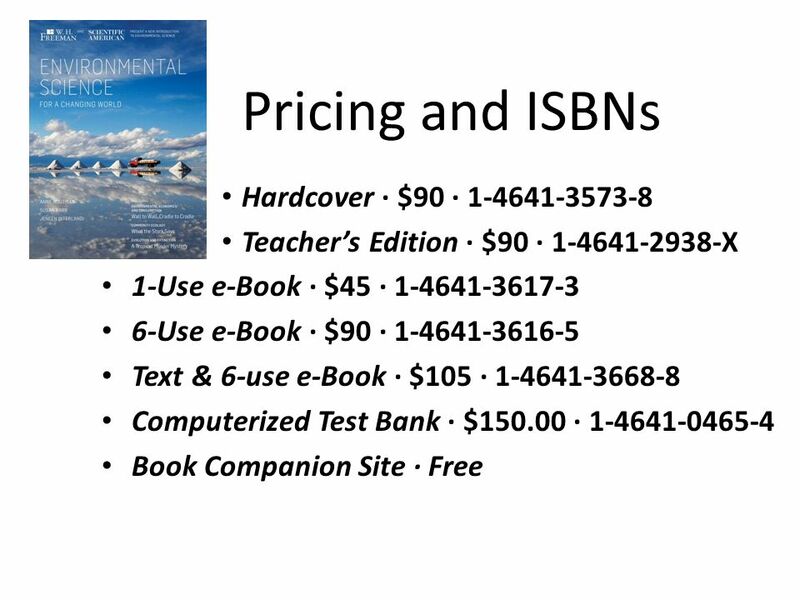 READY TO GET STARTED online study tools for: Scientific American Environmental Science for a Changing World 1 st Edition By Anne Houtman, Susan Karr, and. Welcome to AP PSYCHOLOGY Your Instructor: Mrs. Wilson.